How to wean my baby? How to introduce foods other than breast milk? When can I start giving foods other than breast milk? What all things should I take care of before introducing new food? etc. I will give some quick notes on these. What is Weaning and Complementary feeding? Breast feeding alone is sufficient for your child up to 6 months. There after concentrated energy dense foods are essential to maintain the adequate growth for the infant. The term weaning literally means taking the infant away from breast and providing nourishment by other means. But as breast milk continues to be an important source of proteins, Vitamins like A & C (even for older babies) the use of term weaning is now discarded in favor of complementary feeding. Complementary feeding means giving the child other nutritious foods in addition to breast milk. Care must be taken to ensure that the foods introduced should complement breast milk rather than replace breast milk because this is a very difficult period in the infants life. If the supplements are not adequate, the child becomes malnourished. As its the time, the child is learning how to eat, it is important to be patient and gentle with the child. From the age of six months, the nutritional gap between total energy needs and total energy requirements of the child increases. Also by six months, the child’s teeth begin to erupt and is ready to eat soft and starchy foods. This is called timely complimentary feeding. Early introduction (before six months) of complementary feeding, leads to displacement of breast milk, making it difficult to meet child’s nutritional needs as other foods are nutritionally inferior to breast milk. Sometimes it may even expose the child to risk of diarrhea and other infections at an early age. Late introduction is also risky as it leads to non-fulfillment of the nutritional gap leading to malnutrition and anemia in child. When coming to complementary feeds the taste, texture and consistency of the foods have an important role. The stomach of an infant is small one which get quickly filled by thin foods and liquids. Foods of thick consistency helps to fill the energy gap. A food that stays easily on spoon is just right consistency. 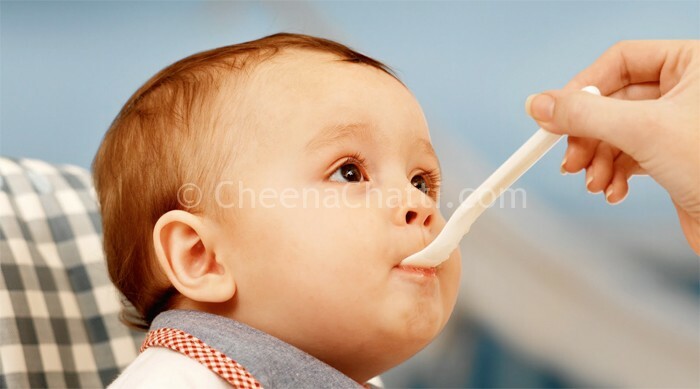 The first food child eats should be soft, homogeneous (mashed or strained) and bland in taste. Later when infant has accepted soft foods, different tastes can be gradually introduced with increasing thickness and varying texture. Small chopped pieces of food can also be mixed. A good regimen of complementary feeding is starting with mashed bananas. With in a week or two, semolina (suji) cooked in milk can be given. Shortly thereafter, well cooked and mashed lentils or peas, followed by gruel (Khichri / Kanji) are added. By eight to nine months of age, the child should be partaking most of the foods cooked in house for adults. Gruel / Khichri / Kanji – Prepared from rice (3 parts) , legume (1 part) along with green leafy vegetable and some milk / curd. Wheat gruel (dalia / broken wheat) made in milk with added sugar. Ragi with Jaggery and Coconut milk. Better avoid cows milk up to 1 year as it may cause cold and respiratory illness in some babies. Delayed complementary feeding and undue dependence on milk can lead to iron deficiency anemia. Soup of dark green leafy vegetables are good source of Iron for infants. When food is first introduced, a small amount should be given 1-2 times a day and slowly increased to 3-4 times daily. Soft porridge (gruel, dalia), Well mashed potato, carrot, sweet potato. Try combining some of these foods together. Non fibrous vegetables eg: cauliflower, pureed spinach, bottle gourd. Dairy products, like paneer, yoghurt and cheese. 3 times per day Increasing gradually to more than 160-170ml at each meal. If child is not breast fed, complementary feeds should be given more frequently than this. Complementary feeds should be prepared from cereals like rice, wheat or maize, pulses, milk and root staples like potatoes. Cereals should be combined with legumes. Complementary feeds based on vegetable proteins alone may not provide the nutrients in balanced proportion as comparable to egg or milk protein. There for addition of a small quantity of animal protein (egg, milk) will make it balanced. Addition of vegetables, fruits, oil, ghee, fats and sugar will improve the nutritional quality, taste and energy levels. Offer food to your baby before or after a breast feed, or in the middle of it. Pick a time that’s good for both of you. If the food is hot, make sure you stir, cool and test it on the inside of your wrist before giving it to your baby. Single complementary food is added at a time, in small quantities followed by second food after some time. The child should be fed slowly and patiently and he should be actively encouraged to eat by paying attention, talking, playing with him and showing pleasure. No force feeding or bribing should be practiced. Encourage him to use fingers or spoon as growing. Very fatty, hot, spicy foods. Salt : As infant kidneys are still immature and cannot cope with the salt. Honey : Your baby shouldn’t have honey until the age of one. This is because honey can contain spores of the Clostridium Botulinum bacterium which can cause a serious but rare form of food poisoning known as botulism. Whole nuts : These are a choking hazard. Certain fishes : Fishes like Shark, canned fishes etc are found to contain mercury. Tea or coffee : The tannin in tea will prevent iron absorption from food. Low-fat foods : Always offer the baby the full-fat versions to get the calories. Single or double toned milk, yogurts and reduced-fat cheeses aren’t right for the baby. Foods which may carry a risk of food poisoning : Avoid foods like soft mold-ripened cheeses (brie, Camembert) soft-boiled or raw eggs. Cow’s (or goat’s or sheep’s) milk as a main drink. The foods should be carefully prepared and stored to avoid contamination. The utensils and hands should be washed before preparing and feeding the child. Cooked food should be preferably freshly prepared and is not to be stored for prolonged periods if there is no refrigeration. Bottle feeding should be avoided if possible. Because it can harbor microbes and can cause respiratory illness in child. This entry was written on September 30th, 2013 by Renoos. Posted in Food and Health and was last revised on September 30th, 2013.
hi I am anew comer from Africa, Ethiopia. and I am Msc student in food science and technology . would accept my membership request thank you!! Greetings, Thanks for visiting us and taking time to drop your comments. Please let me know what type of membership you are looking for.